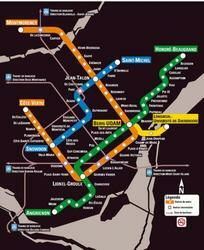 We do want you to enjoy your stay while In Montreal. So explore it safely and just find your way around our city with this free service ! This locator & mapping service is for vehicle driving directions with many free no charge features for your use. Also please follow the simple instructions below. NOTE: Are you having a search problem, well try to enter from the link below. Mapping services are also available in French with limitations from the network providing this gadget. Start your search process by entering the "FROM" address location and then the "TO" address destination, then press "GO" once only. The search process might take sometime to activate a destination map for you and we ask that you click on the "GO" button only once okay ? If you are having some upload problems with this new beta mode gadget, well we do recommend that you search the website of this service provider for more help located under the map locator box above or use a similar or more familiar services available on the internet. Thank you and drive safely plus Bon Voyage ! Contains fare and schedule details with the English help button to the right. CLICK on the image below to produce an enlargement of the map. You can also ask for it at a ticket booth in any of the METRO (subway) stations. � This is a free service ! We do not guarantee that this service will function each time it is used. So please be patient and do try again a little later okay. Thank you !